Running, jumping and throwing in the TRIM area since 1972. We are 45 years old this year and fitter than ever. We encourage participation in running and athletics in a supportive environment. From 100 metres through to marathon running and further, our junior and adult members are constantly pushing themselves and each other to achieve goals they never previously thought possible. With regular training, competitions and social events, Trim AC offers our members a great social life in a fun environment with experienced coaches. 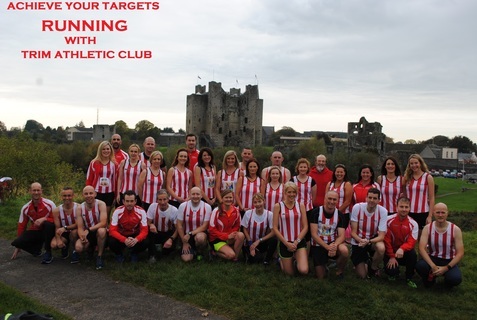 Trim AC meet and train adult group assembles at 7.00pm every Tuesday and Thursday near the White Lodge B & B. There are a number long run training session those preparing for half marathons, triathlons and marathons; training times are arranged among the members of the Tuesday and Thursday groups..
Group training is a proven way for runners to improve and achieve their fitness targets. Training with an AAI affiliated running club gives you access to Athletics Ireland coaching, competitions, insurance and discounts for major events like the national half marathon. Juvenile Training; Monday, 6pm-7pm at the Glebe Driving Range in winter for under 9-12s. There are other training sessions at venues including Boyne CS, Porchfields, Claremont stadium the training times and venues are by notification by the respective group coaches.